Cooking without a Net: TSIR 4: Salsa Gigante! This month I get to kill two posts with one stone. I had already committed to writing a post about salsa on Fitfare, and then Barbara at Tigers and Strawberries announced that the theme for this month's Spice Is Right event is chilies. She asked us to show our favorite recipes using them. 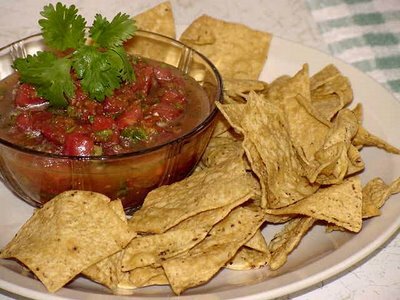 Well, as it happens, my favorite, most long-standing use of chilies is the salsa recipe I got from my friend Donna back in Austin over twenty years ago. As I got older, I was able to tolerate heat a little better, but still didn't care that much for it. But I was developing some uses for spicy foods. After spending a night with a friend I discovered that there's nothing more heavenly than freshly ground black pepper on top of scrambled eggs. And coarsely ground black pepper really livened up my tuna salad. And then, as I wrote in my salsa post on Fitfare, one of my co-workers at the library started bringing in his homemade salsa and selling it. It was spicy and fresh and I couldn't get enough of it. I discovered that it was his use of serrano peppers that made it taste so good, and that was when I discovered that chilies have distinctive tastes, and it wasn't the heat of the jalapenos that I had disliked for all those years--it was the taste of the pickled jalapenos that was all I had ever known that was so distasteful to me. And then, a few years later, the first szechuan style Chinese restaurant opened its doors in Austin, and I tasted yet another kind of chili. Szechuan chilies reminded me of dried serrano peppers--they had the same kind of bright, fresh heat that perked up any dish. Next to tickle my palate was Indian, with it's long slow steady curry heat. And then, I discovered Thai food, with its incredibly hot thai chilies. Now I love all things spicy, including pickled jalapenos. But as soon as summer's bounty brings fresh, ripe tomatoes, I turn to the heat that changed my life and brought all things chili into my life. Drain juice from tomatoes into blender. Add peppers, garlic, cilantro, olive oil and salt. Blend until peppers are just chopped. Pour into large mixing bowl. Put the tomatoes in the blender with the oregano and JUST chop them. Add them to the mixing bowl. Add the chopped tomatoes and the green onions. Let stand for a few hours to allow the flavors to mix. This gets better over time.